It is unfortunate but, few Americans realize or appreciate the large numbers of Native American Indian Tribes that still exist and thrive among us today. In fact, the United States Bureau of Indian Affairs has recognized no less than 567 registered Tribes eligible to receive Government services as of 2015. 2.9 million Americans claim to be of Native American Heritage. The consensus among most Scholars and Historians is that by 1492 when Christopher Columbus reached the New World there was already around 30 million indigenous people calling the Americas home. In North America, they numbered some 10 million. It is believed these people had arrived here from Asia between 14,000 and 16,000 thousand years earlier and spread throughout the Continent and formed into the many different Tribes and Cultures that the Europeans first encountered. Most of the time these new interactions with Native American Tribes were peaceful but, not always. At that time, there were well over 250 different Tribes and Languages in the U.S. alone. The Iroquois of the Northeast and the Creek and Cherokee of the SouthEast and the Navajo of the SouthWest were among some of the earliest Tribes to be encountered. Because of the forced Indian Removal Act by Congress in 1830 many Tribes found themselves relocated to what is now Oklahoma (a Muskogean Indian word meaning red man) and, this is where many great Native American Indian Tribes still live and call home. Some of these include what is known as the Five Civilized Tribes, (the Cherokee, Creek, Choctaw, Chickasaw, and Seminole). Other main Tribes here are the Cheyenne and Arapaho Tribes as well as the Apache and the Caddo Tribes. The Kiowa, Wichita, Osage, Comanche Tribes also call Oklahoma home. There were over 24 major different main Tribes from around the Country forced to relocate here over the years. There are still many reservations located all around the U.S. that is home to major Tribes. Some examples are the Nez Perce Tribe in North Idaho, the Crow in Southern Montana and the Blackfeet in NorthWest Montana. The Navajo in NorthEast Arizona and NorthWest New Mexico region is one of the largest. The State of Alaska has a 14.8% of the total population is Native American, the most of any State. In Washington St. There are the Chinookan Tribes as well as the Salish, Quileute, Sinixt and the Yakama Tribes. All around the Country, there are many Major American Indian Tribes both on and off reservations. The Navajo Tribe in the SouthWest U.S. is the 2nd largest Tribe in terms of population with 308,013 as of the 2010 census but, they have the highest percentage of full-blooded Individuals in their population at 86.3%. The largest Tribe in the U.S. is the Cherokee with a total of 819,000 persons and 285,476 individuals being full blooded. Next in line is the Sioux Tribe with 131,048 registered Tribal members and, in fourth place is the Chippewa Tribe with 115,859. At 5th largest Tribe population is the Choctaw with 88,913. 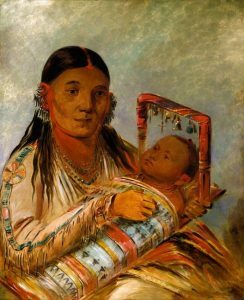 If one considers all the diversity and intervention Native American Indian Tribes have faced over the past 500 years, it is remarkable they have managed to preserve their heritage and Tribal identities at all. Yet, several hundred Tribes like the ones mentioned here remain as a distinctive Tribal entity. Today 78% of Native Americans live off of reservations and this assimilation into regular society continues to increase. Great news for those of you who want to inform and educate your children about the true history of Native American Indians, there are a variety of ways to do this. The Internet is a good place to start for there are many sites devoted to this subject for children. Nothing, however, could replace the fun and adventure of going to visit real American Indians and spending time together. One example is Indian City in Anadarko, Oklahoma. The outdoor Museum is an authentic representation of Indian life from 6 different Tribes that participate there. Another example would be to take the kids to the Great Gathering of Nations Pow Wow in Albuquerque, New Mexico held in April each year. Do something hands-on and the kids will love it.